It’s true that at Protagonist Soccer, we try to stick to the lower league clubs that we love so much. That’s also true of Uni-Formity, as a general rule. But it’s the weekend, so let’s break some rules just this once. One of my favorite arguments is about the national team design, so today I’m going to lay out my top five US National Team kits in descending order. While the USMNT has been far less successful than the greatest national team (USWNT), my memories are tied to the men’s side, so that’s what I’ll stick to. Regardless of my choices, I’m sure you’ll disagree, and that’s ok. Promise. If you haven’t listened to American Fiasco, the podcast about this era of the USMNT, you should close this tab and open a new one. This era was one of the most interesting ones, with drinking, gambling, and teammate wife drama. Really, really great podcast. Back to the kit. This kit was rolled out in advance of the 1994 World Cup, hosted by the United States. The kits weren’t actually made of denim, it was just printed that way. There may be no kit more lampooned than this American classic, but as Alan Seigel put it in his article on Slate, “…as outlandish and stonewashed as it appeared, the design did capture the state of soccer in the United States.” I’ve grown to love this icon of kit design. It’s crazy, a little ugly, and certainly not the crisp lines and colors I praise so often, but it’s American as hell, thank you very much. I have friends who hate this kit. They are wrong. This was a special edition kit, released for the 2017 Gold Cup competition. The kit featured red and blue stripes down the body, with subtle darker stars within the blue stripes. Down the shoulders and on to the arms runs a series of stars that really tie in the feel of the American flag. As a big man, I would never wear this kit, as horizontal stripes aren’t kind to my body shape, but for a player fit and ready for competition, this is a sharp look. And let’s not forget, we won this competition. Maybe because of a good luck charm? 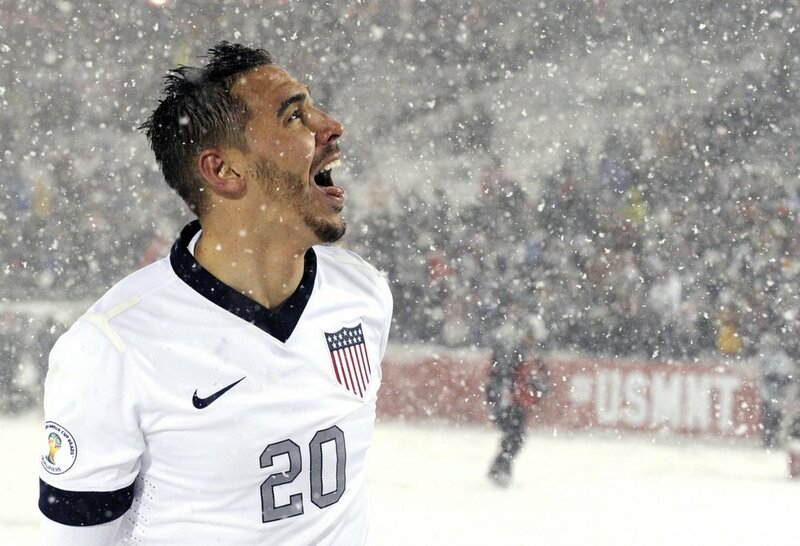 Image courtesy of US Soccer. Ah, the 2010 World Cup. Will we ever be as excited as we were that year? Maybe it was just me, but I was a true believer in this club. Dempsey, Donovan, Bradley, young Jozy, I fully bought into this team. This team gave me my favorite USMNT soccer memory, Donovan following Dempsey, against Algeria, scoring in the 90th minute. You just don’t get better than that, though the Beard’s performance against Belgium in 2014 was a close second. The sash design feels classic, a throwback to kits of the past. Beautifully simple and refined, every color traditional shades, it’s just a beautiful kit. I love it. When you make a list like this, you always think of the critics. I have a friend I used to podcast with, this was always his favorite. Might be the only USMNT kit he owns, certainly the only one he wore around me. It’s really a solid kit. Every color on the kit pops with a super light color palate. I’m a big fan of the centralized number and the coordinated colors of the crests, blue on the chest and red on the leg, it’s smart. One of my favorite kits ever, the 2014 away kit was a winner, but not instantly loved. It took some time for USMNT fans to come around on this one, but I didn’t like Radiohead the first time I heard them, so there you go! Every kit up to this point had been the darker, colorful, away kits, but there is something amazing about a white kit. The Centennial design was to celebrate the history of the National Team and they nailed it. Silver numbering, navy blue piping around the neck and arms, beautiful white kit. Wow. And what is easily missed, the crest is a throwback to the original USNT crest. Looks like a Captain America shield first draft and makes this American’s heart fill with pride. Can we pause for a second and enjoy this picture? Ah, the Costa Rica snow match - “Snow Classico.” I can remember the lead up to this match and the concerns about playing in the Colorado altitude, then the snow came down and it got even crazier. The Costa Rican team arguing for the match to be cancelled, Dempsey’s tap in goal, the US gutting out the win. What a time to be a USMNT fan! Hope you enjoyed the list. While it isn’t lower tier, it’s pretty damn American.